High Speed Rail to Come to Canada? Travelling from Toronto to Quebec via train could be getting faster in the future. It’s the start of the New Year, and of course that implies that we have just ended the previous year. 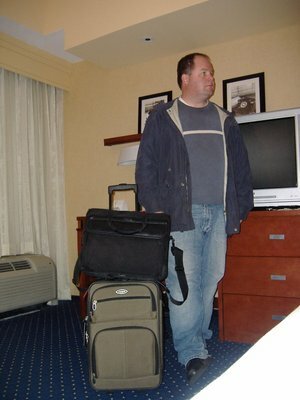 As with many out there, I have taken this time as an opportunity to reflect on 2007. Along with the usual fretting over the fact that another year has passed without getting engaged to Jessica Alba, Jessica Simpson or Jessica Biel (or, really, any Jessica), I take this time as the year ends to see how I fared with travel this year. A lot of this is driven by the fact that many of the reward programs I take part in, like Marriott Rewards, Continental OnePass and Air Canada Aeroplan have qualification periods that run in parallel to the actual year. Luckily for me, I have qualified for elite status in all three of those programs this year, which means 2008 will hopefully mean more comfortable airline seats and bigger hotel rooms. I have also, for the third year, calculated how much I flew and how much carbon I threw up into the atmosphere. This year I flew an exceptionally large amount, even for me, with 81 flights totaling up to 80,785 actual miles flown. This is the most I have flown any year, fuelled mostly by the cross-country trips from Toronto to Seattle early in the year, and my recent weeks flying north-south between Toronto and Houston. According to the carbon calculator I used, all that travel added up to somewhere around 27 tonnes of carbon put into the atmosphere. Yikes! And so I was off to purchase a number of carbon offsets to assuage my guilt about so recklessly destroying the planet. Good news for the planet, though, is that I didn’t actual fly anywhere for a Christmas vacation this year as I have the past few year, instead electing to stick to the ground and take the train up to Quebec City. While it’s diesel engines do spew carbon into the atmosphere, the amount is less than flying, and the carbon isn’t flung into the high atmosphere, instead it’s spewed out at ground level to choke the local fauna as the train cuts through the Quebec forests. My train, operated by Via Rail Canada, left downtown Toronto’s Union Station at 11:30 AM on December the 30th, travelling pokily along and making a number of stops as it headed east and north towards Montreal, arriving at 5:02 PM. After a 50 minute stop-over (enough time to grab a burger from McDonald’s, another few tonnes of carbon thrown into the atmosphere), I was back on the train heading towards Quebec City, arriving at the impressive and imposing Gare du Palais in Quebec City at 8:56 pm. The total trip took 8:33 minutes to cover the approximately 800 kilometers between Toronto and Quebec City, averaging 100 kilometers per hour. That’s not very fast, providing a similar speed to driving and certainly much slower than flying, which takes 1 hour and 25 minutes. I choose the train, though, instead of driving or flying though, because I was on vacation and in no real hurry to get anywhere. Instead, I wanted a nice relaxing trip, allowing me to look at the scenery, read a book (it was a Michael Crichton thing about talking monkeys) and relax. While this is an idea that has been tossed around a number of time over the past 20 years, the two Premiers (the leaders of the provincial governments, for those not familiar with the Canadian political structure) have a number of reasons to study the idea now. In addition to the desire of voters to see Canada meet carbon reduction targets, Quebec and Ontario are both large manufacturing economies. The price of oil has been skyrocketing, causing the cost of manufacturing to rise, while the Canadian dollar strengthening against the US dollar and the softness in the US economy meaning that our exports to USA are becoming more expensive just as Americans are tightening their spending. A $20 billion dollar project to build high speed rail would mean jobs, especially for a company like Bombardier, maker of high speed train engines and cars. I’ve in the past covered how cool it would be to have a high-speed train in the high population Ontario-Quebec corridor that runs from Windsor, Ontario (just across the river from Detroit) to Quebec City and includes major population centers like Montreal, Toronto and Ottawa. Nothing more clearly brought this to my attention than two different trips I made this summer. The first, taken 5 times between May and July, was between Toronto and Detroit. The distance between these two cities is a straight 370 kilometers along. Via Rail runs trains down to Windsor, Ontario, but the trip takes almost 4 hours and the departures are too late in the morning to get me to Detroit on Monday mornings in time for work. 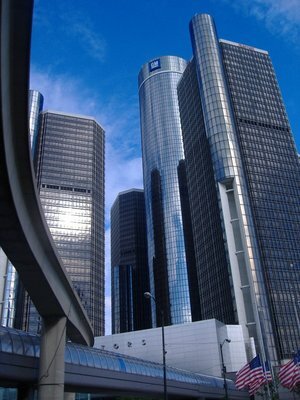 Instead, I ended up flying Air Canada into Windsor, and taking a combination of taxis and buses between the Windsor airport and my workplace in downtown Detroit. In August, I headed over to Europe. Obviously I had to fly across the Atlantic (no trains to take there), but once I landed in Europe, I spent two weeks travelling almost exclusively by high speed rail, travelling between London, Brussels, Cologne, Amsterdam and Frankfurt on the fast and comfortable high speed Euro-trains. 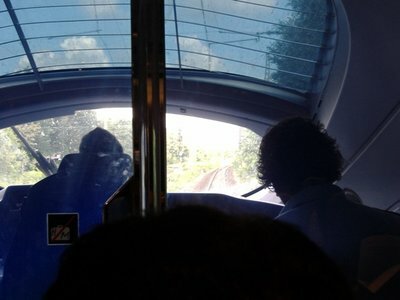 On the trip between Cologne and Amsterdam, I was even lucky enough to sit in the front cabin, where I could easily see out the front window and watch as we sped between Germany and the Netherlands. 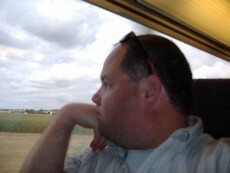 Now, the interesting thing is that if you do the math, the train isn’t really that much faster Europe. From London to Frankfurt is a total of around 800 kilometers, which the trains cover in 6 hours and 32 minutes, or around 130 kilometers an hour. Despite having ICE trains that can travel up to 300 km/h, for the most part the trains can’t travel that fast for much of the length of the trip. Things are getting faster though. The Cologne to Frankfurt part is all high speed track, and the train is often travelling in excess of 250 km/h, and the UK is building their infrastructure to get the Eurostar moving faster. What is very impressive about the Europe trains, though, is the fact that they run so frequently. Looking at taking a train from Toronto to Windsor, the earliest I could get out was 7:50, arriving in Windsor at 11:30. The first flight out of Toronto airport leaves 7:15 and arrives at 8:22, meaning I have to leave my house around 5:30 to get to the airport and clear security. Leaving my house at 5:30 am to catch a 6:00 AM train would be possible. A 6:00 AM train would arrive in Windsor at 9:45 AM, and I could be across the river quickly and at the office by 10:30. That would be a completely doable proposition. 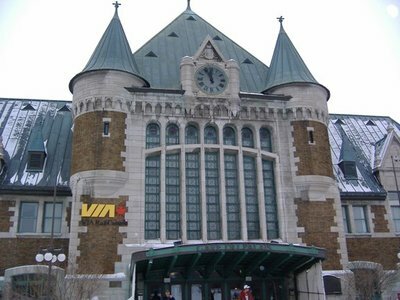 While the trains in Europe may not be as quick as they possibly could, they run often and they are comfortable, and that’s something that Canada needs to do in the Windsor-Quebec corridor to make train travel something that’s more than just a mode of travel for tourists who want scenery and relaxation.